Right now it is definitely a time to take an economic opportunity of historically low mortgage rates and a new homeowner tax credit up to $18,000 by buying a new home in Mountain View. Miramonte by Classic Communities is superb community of new single family detached homes in Mountain View located within walking distance of downtown Mountain View. 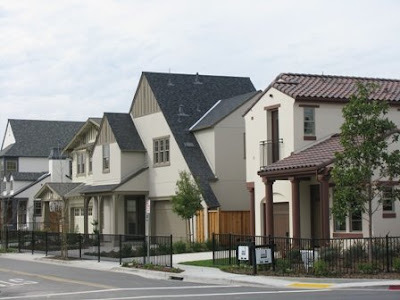 The 58 homes of Miramonte built by Classic Communities include two car garages and secure private yards. These new homes range from approximately 1,650 to 2,650 sq. ft. and offer up to 5 bedrooms and 3.5 baths plus cozy fireplaces plus and a 15,000 square foot open space area. Relative to the surrounding fifty year old homes, the new Miramonte homes are priced well, from the $900,000 to $1,500,000; and reflect what many home buyers are looking for in Mountain View. HOA fee is surprisingly low, just around $40 per month. New homes of Miramonte Mountain View located on the former 6.73-acre Southbay Christian school site at 1136 Miramonte Avenue in Mountain View near border with Los Altos. The Southbay Christian School was closed on 2002 due to declined enrolment. The real estate property surrounded by McKelvey Park with baseball field and softball field, the Permanente creek and private homes. The Permanente creek flows from hills owned by Hanson Permanente Cement (formerly Kaiser Cement). The Kaiser Cement company was on of the 100 companies started by industrialist and shipbuilder Henry J. Kaiser. He also started Kaiser Permanente, the first health maintenance organization. The name Permanente came from Permanente Creek. The creek, in turn, was named "Permanente" by the Spanish because it was a reliable source of water that didn't dry up in the summer. Permanente Creek has a history of flooding, having experienced major flooding in 1862, 1911, 1940, 1950, 1952, 1955, 1958, 1963, 1968, 1995 and 1998. The Santa Clara Valley Water District (SCVWD) recently started Permanente Creek Flood Protection Project. The project goal is to provide flood protection to homes, streets, businesses, and public facilities in the Permanente Creek watershed. Despite the quiet location, Miramonte home owners are only a few steps away from the work and entertainment - ten minutes walk takes you to multi-cultural restaurants, sidewalk cafes of Downtown Mountain View, twenty minutes walk to Mountain View Caltrain and Light Rail station, ten minutes drive to offices of Google, Intuit, Microsoft, LinkedIn or any other company in North Bayshore district of Mountain View. 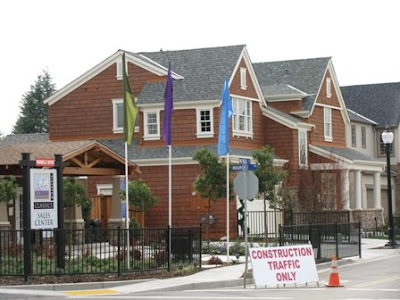 In case as future home owner you are still concern about traffic noise from Miramonte avenue, consider checking new homes of Satake Estates by SummerHill Homes located on the former Satake Nursery site at 1079 Marilyn Drive in Mountain View. Based on the map of enrollment boundaries for Mountain View Whisman School District and Mountain View Los Altos Union High School district the students from Mountain View Miramonte homes may attend Bubb Elementary school, Graham Middle School and Los Altos High School. The first two schools located within safe five minutes walking distance from community, while Los Altos High would require at least basic biking skills. There are also several private schools near by like K-8 Miramonte School in Los Altos and St. Francis High School in Mountain View. "Unbiased reviews of San Fracisco Bay Area real estate"? LOL! "superb community," "tasty incentives," "well priced" don't sound so unbiased. And people wonder why realtors have a bad reputation. Miramonte is really a better place to live, comparing with any other new development in Mountain View like Gables End, Mondrian, Wild Orchid or Bedford Square. Perhaps only Satake Estates homes could be better, but it is almost Los Altos. any insight on the Granada Park complex right off shoreline by Barry Swensen?